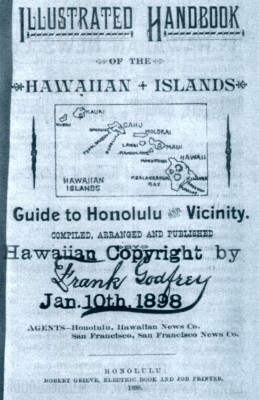 frank godfrey : waikiki, 1898.
and Guide to Honolulu and Vicinity. Compiled, arranged and published by Frank Godrey. 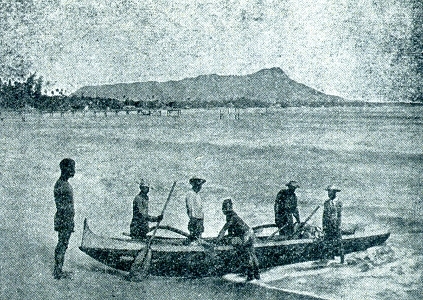 Printed by Robert Grieve, Honolulu, 1898. 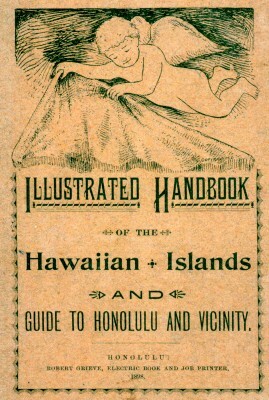 A basic travel guide with a very basic description of surf bathing at Waikiki by the Rev. Gowen, the "Late Chinese missionary in Honolulu." Here, every afternoon, and especially Sunday afternoons, may be seen stylish equipages in which are seated many of the elite and notables of Honolulu. Bicyle parties, on single, tandem and triple safetys, speed along, while the more leisurely enjoy the ease and comfort of the tramcars. WAIKIKl BEACH, four miles frm the city, is the Mecca of all visitors to Hawaii. It is the famed bathing- place which has been written about in prose and verse by Mark Twain, Charles Warren Sooddard, Rollin Daggett and others. Here one may enjoy on any day in the year, on the edge of the broad Pacific, a quiet hour without the chilly blasts of the East or North, or the stifling heat of the torrid Sonth, to disturb his comfort. At "Long Branch Baths" the bather may find deep water and at a temperature which will surprise him, permitting a two or more, hours enjoyment in plunging and bathing in the pure waters. "how to run a hotel," will be prepared to make the stay most pleasant. Although not as pretentious in surroundings as its namesake on the Atlantic Coast it possesses qualities of air and sea and sky, unknown at that famed watering place. Everybody stops at "Long Branch," and ladies and children especially will find the stay most pleasant. On Sundays and other days many of the beach-dewellers indulge in surf-riding and, as the breakers chase the frail canoe in their swift shoreward flight, the sight is exhilirating even to the onlookers. The tramcars pass along the line of the Beach every half hour. From Long Branch en route to Kapiolani Park one passes several cozy hostelries which afford food and raiment to bathing visitors. The truly "embowered" home of Princess Kaiulani is pointed out to the traveler, the grounds surrounding the seaside residence of the late Queen Liliuokalani. The Waikiki bridge is crossed Ilnd a peep is had of the pleasant "Makee Island" where Sunday sacred concerts are given by the Hawaiian Band. Geoff Cater (2012) : Frank Godfrey : Waikiki, 1898.